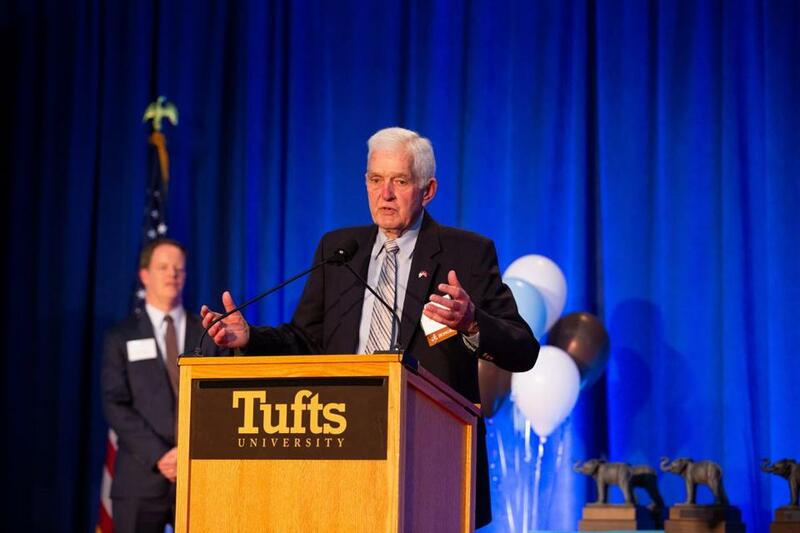 Mr. Sands accepted an award at Tufts University’s inaugural Athletics Hall of Fame ceremonies in April 2018. More than 60 years after he skated on defense for Tufts University, Ben Sands, the team’s former head hockey coach and longtime benefactor, stepped to the podium at Cousens Gymnasium last April. Mr. Sands, who also formerly chaired the North Reading Board of Selectmen and the town’s Housing Authority, died Jan. 10 in Massachusetts General Hospital from complications of a stroke. He was 85 and divided his time between North Reading and his family’s cottage in Melvin Village, N.H. The locker room at Valley Forum in Malden, where Tufts plays its home games, is named for Mr. Sands, whose initials are displayed on the current team’s uniforms in his memory. He founded the Friends of Tufts Hockey, was a past vice president of the Tufts Alumni Association, and was a recipient of the school’s Distinguished Service Award. In 2015, Mr. Sands donated his memorabilia — including newspaper clippings, schedules, programs, photos, and rosters — to the university’s Digital Collections and Archives Department. A son of Benjamin Franklin Sands Sr. and the former Sally Burns, Benjamin Franklin Sands Jr. graduated from Reading High in 1950 and from Tufts in 1954. That year, he married Tufts freshman Judy Lundegren of Marblehead. A Navy ROTC member at Tufts, Mr. Sands served with the Marines after college and then began a career as an independent sales representative for several packaging companies. A founder of North Reading’s youth hockey program, Mr. Sands coached the North Reading High team for two seasons. The first was a spectacular 17-2-1 campaign, in 1977-78, when the team advanced to the Eastern Mass. semifinals. Tufts had dropped varsity hockey in 1960 and then instituted a club team later that decade. In 1982-83, Mr. Sands became its coach and advocated for it to return to varsity status, which it did in 1986. Playing in NCAA Division 3, the Tufts Jumbos went 13-9 that first season. Over his six seasons, Mr. Sands’ teams compiled a 73-63-4 record. The Jumbos set a school record of 18 victories in 1987-88 that still stands, and for that, Mr. Sands was honored as the Eastern College Athletic Conference Coach of the Year. At the time, Mr. Sands contacted as many players from the past as he could and requested donations to start the Friends group, his wife recalled. After leaving coaching, Mr. Sands was a scout, recruiter, and confidant for those who followed him. At the end of each season, an award in his name is given to a Tufts player who shows the same passion for Tufts hockey that he did. In 2005, Ben and Judy Sands turned the annual winter training trip for the Tufts women’s swimming and diving team into a humanitarian effort by organizing the donation of nearly 5,000 pounds of supplies for children in the Dominican Republic. The couple continued to take annual trips to Guatemala, bringing toys and other donations to children in remote villages for several years, a tradition carried on by their daughter Thyra Sherman of Andover. A ranked tennis player and a triathlete, rower, and water skier, Mr. Sands enjoyed entertaining his fraternity brothers over the years at his cottage in New Hampshire. He belonged to the Church of the Good Shepherd in Reading, where he served as senior warden and church clerk, and he was a quiet, driving force in the $200,000 renovation of its roof. He loved displaying votive candles outside his home during the Christmas season. A service has been held for Mr. Sands, who in addition to his wife, Judy, and his daughters Carey and Thyra, leaves two sons, Benjamin III of Chester, N.H., and Douglas of Manchester, N.H., another daughter, Kim Chabot of Suwanee, Ga.; a brother, Loring of Oakwood, Ill.; 12 grandchildren; and two step-grandchildren.